Description:- Rose and Joshua first met when Joshua and his dad came to live with Rose and her mum. Then their world turns upside down when their mother and father go out for dinner one evening and never return. With police inquiries going nowhere, Rose is dispatched to live with her chilly, unfriendly grandmother and Joshua is sent to live with his uncle. Then Joshua comes to London to study and Rose is witness to not one, but two murders. Why is this happening to Rose? Can it be anything to do with the investigations Joshua has been doing into the disappearance of their parents? 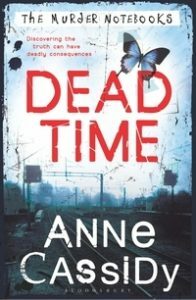 A taut and pacy thriller that is the start of a stylish new series from an acclaimed writer for teens. Review:- I started out reading this book wondering who it had been written by, it seemed so young. Was it the language or in fact that the author is young and this is coming across in the way it was written. I’m going to be honest, although there were bits of this book that we extremely good I didn’t overly like it. I couldn’t get over the way it was written. The plot in terms of suspense was excellent but the immature conversations that took place between the characters that didn’t seem to add anything spoiled it. I really didn’t know who it was who had killed Ricky Harris until the end which was great. The interaction between the characters was disappointing, I wanted more from them, more passion, more depth of conversation. I didn’t understand why the main characters didn’t kiss, I mean that’s what would have happened in real life isn’t it??!! The character of the police officer is strange, what is the point of his friendship with the main character – it’s not like this added to the storyline and he just kept popping up but not adding any depth to the story. He wasn’t even the one to work out what happened! I felt let down by the ending too, is there going to be another book? not sure where the story could go next for a full book. You get no answers from the book apart from who killed Ricky Harris. It left me asking more questions and not feeling satisfied as I believe a story should. This is a guest review by the lovely Jo Dunlop, why not check out her blog at Mummys Knee. Thank you Jo for such an honest review. Disclaimer:- I was sent the above book as stated in the post from the publisher. I’ve not been paid further for mentioning any of these products in this post. All words and opinions are my own and the links have been included out of courtesy.